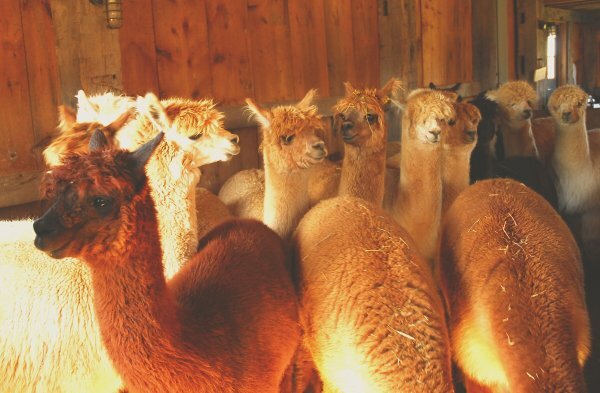 A beautiful sunny day, with a host of friendly staff, family, and friends, and a lot of advance preparation, Island Alpaca sheared a total of 67 alpaca. (Included in the mix were a number of other alpaca belonging to other islanders, and to some owners who currently board their alpaca at the farm.) 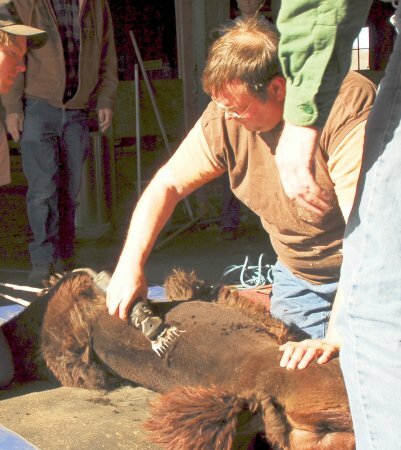 The Best's, from New Hampshire were at hand shearing the alpaca, with assistants Cody Fifield of New Mexico, James Grady and Steve Phillips of New Hampshire and Maine. 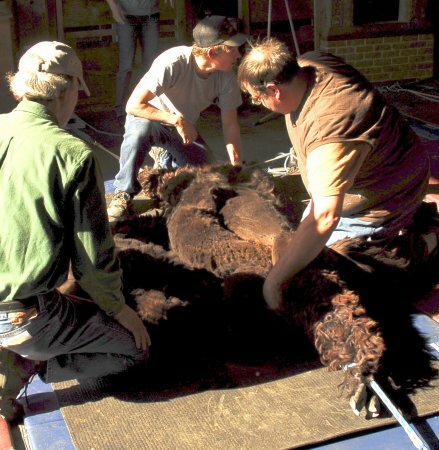 Other helpers were Charles Ronchetti, trimming 536 toenails, Nancy Ronchetti and Neil Hartery and Douglas Touart sorting and bagging fleece as it was shorn, and Kathleen Byrnes weighing and documenting fleece. Evelyn Ronchetti kept the area clean and clear so that the fleece was kept separate. Sue Currier, Phoenix Russell, and Philippe Morin, prepping and delivering the alpaca, Sandy D'Amico and "Ba" Dutton and as our hosts, and Louise Ronchetti, knitting, Heather Welch welcoming visitors to the store, and Caila Morin and Tonya Thomas welcoming visitor at the entrance. Pat Waring and Toni Chute helped with the food, and finally Mike Tullos served the role of "farm photographer" for the day. In just under 8 working hours, roughly 7 minutes per alpaca. to yield over three hundred pounds of fleece, much of which is destined to go to a New Hampshire fiber mill this week, for processing into our yarns that we will sell in our farm store, and offer to local knitters to produces clothing and accessories for our store. And the rest, to the local alpaca fiber cooperative to produce many of our socks, gloves, hats and scarves. The farm also had door prizes as we do every year. Winner of the Island Alpaca blanket is Rose Cecil of Edgartown, and Megan Wiener of Cumberland, RI won a gift certificate, and Missy Willoughby of Edgartown, won the Alpaca stuffed toys. 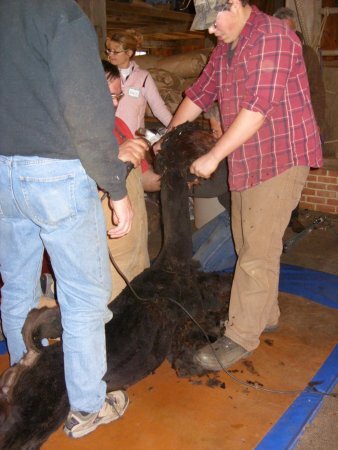 Click here: Alpaca Farm Shearing Day, to see some photos from last ears event! 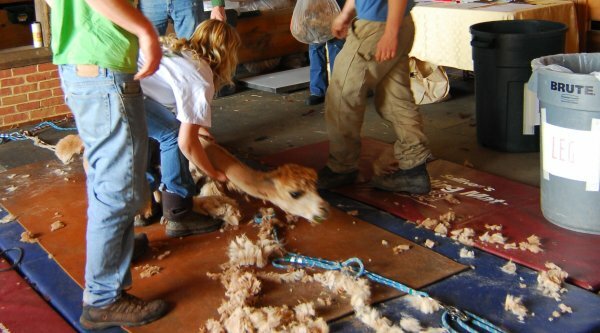 You can also see our first annual cria-shearing event on our site here.